I am really bad at explaining things so I will just use images to best illustrate what I am trying to do. 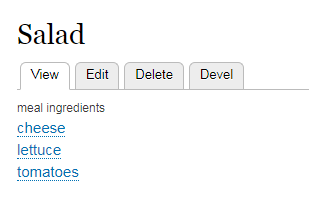 To summarize, I am learning Drupal 8 and I thought my pet project would be to create a grocery list application. In simple terms, you add ingredients with there cost, quantity, and store, ect. From there, you combine the ingredients to create a meal. Finally, you select all the meals you want to buy for the week, and it will generate a grocery list with all the ingredients, with cost and quantity. The issue i'm running into with views is that I can only go 1 level deep down the hierarchy chain. Let me demonstrate with pictures. Next, I can dive into 1 of the meals, ex: Salad. 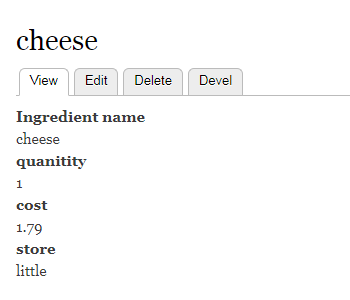 From there, I can dive even deeper and view the cost or quanity of a ingredient, ex: cheese. Now what I am trying to achieve with my view is getting the cost or quantity (either is preferable at this point), to display. However, I can only go down to meal ingredients and it stops there. 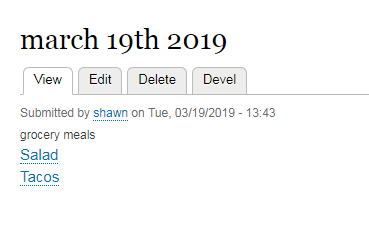 I am already using a relationship to display the meal_ingredients, but there is no option or relationship to reference ingredients. 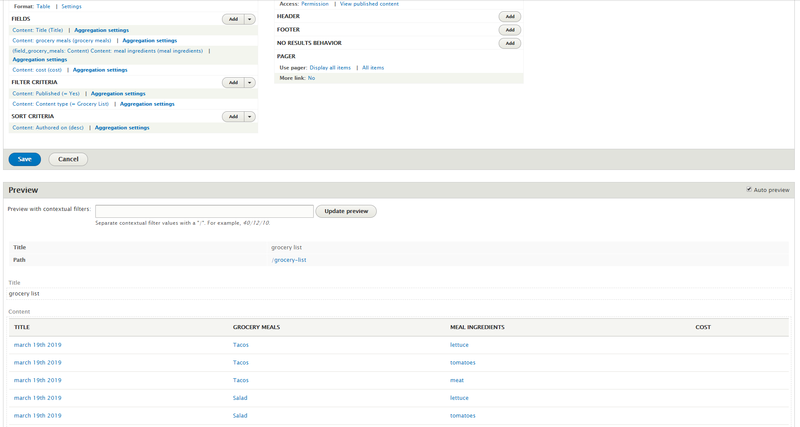 If I change the filter to CT = meal or ingredient, the cost value is displayed, but on other lines. How do I dive 1 step further and get my table to display the cost / quanity without changing the filter? Can views go only 1 level deep? Browse other questions tagged views 8 or ask your own question. How to use GROUP BY and SUM in Views table?